November 16 sees Singapore hosting the first Cruise Shipping Asia conference so we have a look at plans there for the opening of a second cruise terminal and projections that will see cruise passenger numbers at Singapore rise to 1.5 million by 2015. Elsewhere, we look at the winner and loser cruise ports of 2010 (2011 will of course be different). Classic International’s Princess Daphne returns to the German market on a three-year charter to the new Berlin-based Ambiente Cruises. And as the last Canadian Pacific passenger ship is about to be returned to Canada, we look at the contributions Canadian Pacific has made to cruising. 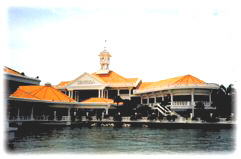 While the twenty-year-old Singapore Cruise Centre at Harbourfront includes not only a cruise terminal and three ferry terminals, but also an MRT rapid transit station for getting into town, it has not always been able to cope with the numbers of cruise ships calling in Singapore. When the port was busy in recent years some ships have had to berth at more out of the way and inconvenient cargo sheds. That will soon end, however, with the opening later this year of the new International Cruise Terminal at Marina South. The new terminal will allow the Southeast Asian port to accommodate a new generation of large liners of up to 360 metres (1,181 feet) in length, carrying say 5,000 passengers on a draft of up to 11.5 metres (37.7 feet). And as Singapore likes to make its cruise terminals easy to reach, by 2014 it too will have its own MRT station. Present customers with cruises starting in Singapore include Azamara Club Cruises, Celebrity, Costa, Crystal, Holland America Line, Oceania, Princess, Regent Seven Seas, Royal Caribbean International, Silversea and Star Cruises. In all, a record one million cruise passengers passed through Singapore last year from 34 cruise lines. Malaysia-based Star Cruises, a major player in the Asian market for fourteen years, was the main player until five years ago, but in addition to Royal Caribbean International, new ships will be soon also coming from Seabourn, AIDA Cruises and Costa Cruises as well. The forecasts are that the numbers of cruisers, which have already grown more than 60% in the last five years, will grow a further 30% over the next two years, so that by 2013, Singapore will be handling 1.3 million cruise passengers and by 2015 1.5 million, a 50% increase on today’s traffic. 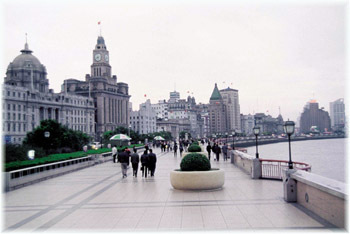 No wonder that once the second terminal opens, the island state aims to became the cruise hub of Asia. Singapore’s efforts to attract cruise lines got a huge boost last month with the announcement from Royal Caribbean International that it would base one of its largest ships, the 3,114-berth Voyager of the Seas, at the port for a season starting on May 26, 2012. Although the 148,528–ton Queen Mary 2 calls there during her World Cruise, the 137,280–ton Voyager of the Seas will be the largest cruise ship ever to have been based in Singapore for a season. Her much smaller fleet mate, the 69,130–ton Legend of the Seas, had been their previous Singapore ship, first working from there in 2008, but she moved to Shanghai last year. As well as Singapore, the Voyager will offer cruises from Shanghai and Tianjin in China and at the end of the season there will be a 14-night positioning cruise from Singapore to Fremantle, leaving Singapore on October 22. The Voyager will then start her first season of Austral summer cruises from Sydney on November 5. A dozen years ago, when the Voyager of the Seas was first introduced, Royal Caribbean intimated that she would never be used outside of North America. But the growth in world cruising has been such that even larger fleet mates have now been based in Southampton and Barcelona. With the growth of a middle class in countries in Asia, Singapore now estimates that the potential cruise market from just India and China alone could be 74 million passengers. With its top class infrastructure and well-earned reputation as a tourist destination, Singapore sits at the crossroads of these potential markets. 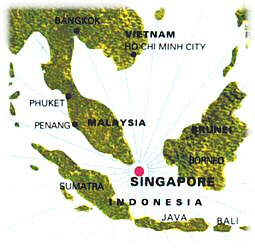 And besides attracting overseas cruise passengers, Singapore itself is a good source market. Next month, from November 16 to 18, Singapore will also host the first ever Cruise Shipping Asia show, a spin-off from the Miami-based industry event that takes place every March. To take place at the Marina Bay Sands Expo and Convention Centre, much more in the way of news will be coming from Singapore in the near future. With the 2010 cruise port statistics in, it might be worth taking a moment to see which ports are up and which are down from 2009 to 2010. 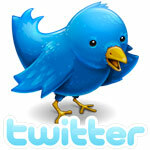 These figures have been compiled by Tony Peisley for Cruise Insight magazine. In the top fifty world cruise ports, the winners are Costa Maya, up 99% from 329,000 to 655,000 cruisers; followed by Roatan, up 54% from 475,000 to 730,000; Katakolon in Greece, up 46% from 648,000 to 948,000; Freeport, Bahamas, up 43% from 552,000 to 787,000; and Malaga, up 35% from 488,000 to 659,000. 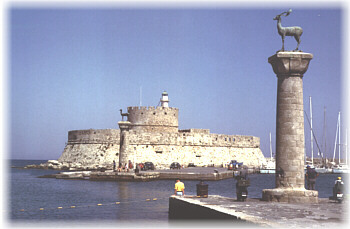 Losers included Antigua, down 15% from 713,000 to 607,000 cruisers; two Greek ports – Rhodes, down 23% from 724,000 to 561,000, and Mykonos, down 14% from 757,000 to 650,000; followed by three Alaska ports: Juneau, down 14%, from 1,021,000 to 876,000; Skagway, down 13% from 741,000 to 648,000, and Ketchikan, down 12% from 937,000 to 829,000, the latter because of a contentious head tax that caused cruise lines to act with their fleet and withdraw tonnage from the Alaska trade. Among embarkation ports, with more product on offer New York saw 31% growth from 866,000 to 1,134,000 passengers in 2010; Genoa was up 28% from 671,000 to 860,000; Santos, up 27% from 769,000 to 980,000; and Port Everglades, up 17% from 2,837,000 to 3,314,000. Both Venice and Southampton, each of which has been developing additional cruise terminal facilities, also gained 14% last year. On the downside, the biggest loser was Vancouver, down 36% from 898,000 to 574,000, victim of the double whammy of the expansion of Seattle to the south and the Alaska head tax. Vancouver’s loss of 324,000 was substantial compared to Seattle’s gain of only 57,000. Many of these changes are temporary however as trades change. The world’s top cruise port, Miami, gained only 1% last year, rising to a throughput of 4,145,000 passengers compared to 4,110,000 in 2009. Royal Caribbean International’s decision to base the Oasis and Allure of the Seas at Fort Lauderdale accounted much of the rise at that port. Commencing in April 2012, Classic International Cruises’ Princess Daphne will be going on charter to Ambiente Kreuzfahrten of Berlin for at least three years. 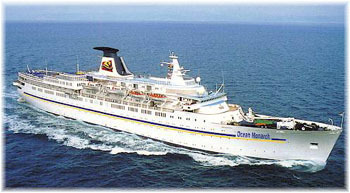 The ship is well known in Germany from the years she was offered in that market by the now-defunct Hansa Kreuzfahrten. Ambiente’s parent company FFR Reise Service is controlled by the German Social Democratic party, which in the past has also marketed cruises under its SPD Reise Service brand. A small number of ex-Hansa personnel are understood to have joined the new cruise operator. Converted from the Port Line refrigerated ship Port Sydney into the cruise ship Daphne in 1975 by Greek shipowner J J Carras, the Daphne later cruised for Costa Cruises and became the Princess Daphne for Classic International Cruises in 2008. For a time she traded as the Switzerland and also as the Ocean Monarch for Page & Moy in the UK. She will now offer cruises in the Mediterranean, the Atlantic and Scandinavia. This weekend saw the final tours on board the former Canadian Pacific Great Lakes cruise ship Keewatin, which has been moored at the Lake Michigan port of Douglas, Michigan, near Saugatuck, since 1967. Roland Peterson, now 85 and owner of Douglas’s Tower Marina, purchased her after her retirement in 1965 in order to save her from the scrappers and has since maintained her as a nautical museum. An Edwardian-era passenger ship, she was built on the Clyde in 1907 and capable of carrying 288 passengers. The Keewatin features a two-deck high central well topped by clerestory windows, a central stairway, oak-finished cabins, observation lounges, formal dining room and hand-painted Italian glass windows throughout. The deal for her purchase by Skyline International Development Inc was closed on Thursday last. Skyline intends to have the 350-foot 3,886-ton Keewatin towed next spring to her former home port of Port McNicoll, in Tay Township on Ontario’s Georgian Bay. As part of the deal, the new owners of the Keewatin will dredge the Saugatuck-Douglas harbour so that they can tow their ship away. “We are thrilled to return the world’s last Edwardian passenger steamship to the people of Tay Township and Canada,” said Gil Blutrich, Skyline chairman and president. Port McNicoll as an 800-acre resort village about seventy minutes north of Toronto. With six and a half miles of shoreline, the entire area is being redeveloped by Skyline International as a $1 billion resort community of condominiums, cottages, hotels, shops and marinas. In their heyday, the Keewatin and her sister ship Assiniboia operated weekly cruises from Port McNicoll to Sault Ste Marie and Thunder Bay, with the Keewatin sailing on Wednesdays and the Assiniboia on Saturdays after the arrival of the Canadian Pacific boat train from Toronto. One-way passengers could transfer back to the railway in Thunder Bay to continue their journey west and vice versa. Although still in the rail business, Canadian Pacific abandoned its last connection to shipping In October 2005, when the independent CP Ships container ship operation was sold to Hapag-Lloyd. It had ceased its passenger ship services over a number of years, closing down its Transpacific Empress operation on the outbreak of war in 1939, the Great Lakes trade in 1965, its Transatlantic Empress operation in 1971 and its Alaska cruise service in 1981, but it was still carrying passengers in twenty-one of its container ships prior to the sale to Hapag-Lloyd six years ago. But many signs of Canadian Pacific remain, even in today’s cruise industry. Princess Cruises, for example, took its name from the 6,062-ton Alaska cruise ship Princess Patricia, which it chartered for two winters to cruise from Los Angeles to the Mexican Riviera from 1964. 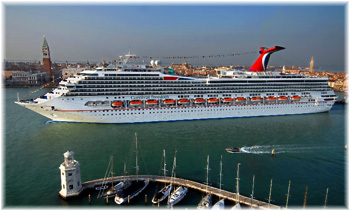 Carnival Cruise Lines adopted its funnel design from the former CP Ships logo by changing the colours and making a circle out of a triangle when it purchased its first ship, the Empress of Canada, from Canadian Pacific, and renamed her Mardi Gras. This ship was Canadian Pacific’s last North Atlantic liner and every new Carnival ship to this day has been built with an Empress Deck. Canadian Pacific was also the first line to build a dual-purpose North Atlantic liner and world cruise ship, with its 42,348–ton Empress of Britain, eighty years ago in 1931. This design was adopted post-war by Cunard Line’s 34,183–ton Caronia and has most recently been adapted by the Queen Mary 2. 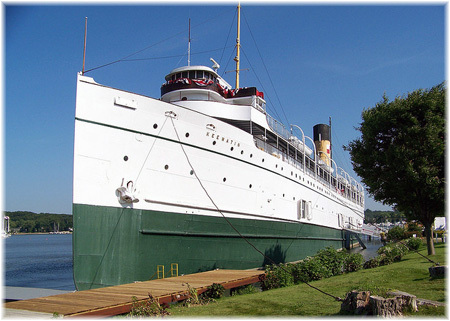 While Douglas may be losing the forty-five-year presence of its Edwardian cruise ship, the area will at least be gaining an active cruise ship in 2012, when Travel Dynamics returns to the port of Saugatuck next summer. Seven calls are planned for the 2,354-ton Yorktown, which has a shallow enough draft, beginning on June 7. Whether the Keewatin will be gone by then remains an open question but the present plan, if dredging proceeds well, is that the Keewatin will be moved from Douglas to Port McNicoll in June.